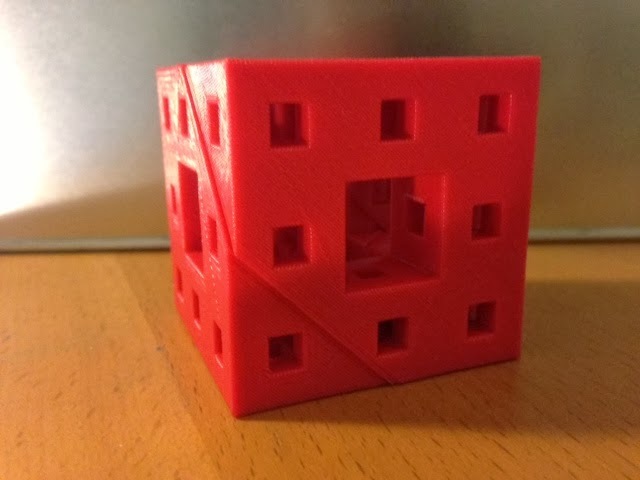 Today we printed owens' Diagonal Cut Menger Sponge design from Thingiverse. If you sliced a Level 2 Menger sponge in half along a diagonal plane as shown in the picture, what would the sliced face look like? Before you scroll down, take a look at this picture and try to imagine it: If you could see the hidden diagonal face made by the slice, what would it look like? Would it have holes in it? What kind? Don't peek! Settings: MakerWare .3mm/low, with no raft and no support. This makes a nice model but the detail on the stars could be better, so next time we'll use a finer setting. Further reading: Making sliced Menger cubes is a popular sport. MadOverlord's design Diagonally-Sliced 3-Level Menger Sponge is a nice Level 3 version. Over at the Simons Foundation, George Hart has a nice video about slicing Menger cubes. 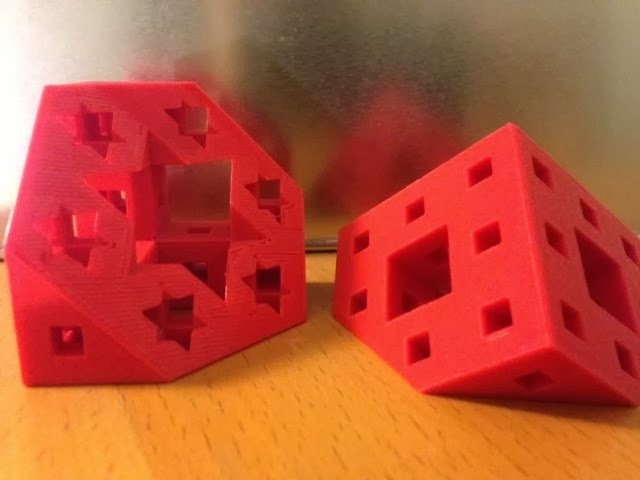 And Gaya has a nice post on her blog A Girl with a 3D Printer about the advantages of printing Menger cubes diagonally instead of in the upright position. Printing upright/horizontally causes great sadness and an impossible amount of support to remove, but diagonal printing allows for beautiful prints without any support material at all.